Hi Form offers a wide range of naturopathic veterinary formulas that are specifically designed for the welfare of horses, including HerbaNerve. HerbaNerve a naturopathic veterinary formula that helps to keep a horse calm and stress free without impacting on the horse’s performance. Assisting in the maintenance of normal muscle and nerve function, HerbaNerve formula incorporates a selection of nutrients that play a role in assisting the transmission of nerve impulses. This naturopathic formula does not contain Valerian. 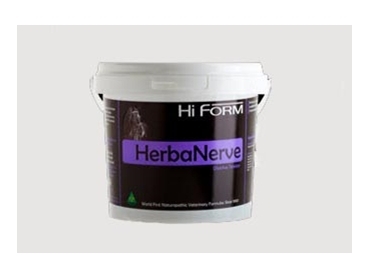 HerbaNerve naturopathic veterinary formula is suitable for use on a daily basis and can even be given to horses before competition, depending on their requirements. HerbaNerve horse calming supplements are available in quantities of 500g, 1.5kg, and 3kg, and 500g will offer a minimum of 50 days supply. Hi Form would like to highlight that dose rates on the first batch of HerbaNerve, with the new-look label, are incorrect. The recommended dose for HerbaNerve is once daily, not twice daily as the label suggests.